The king of dramatic melody and Italian passion died on January 27th 1901. He was admired, revered and acknowledged as probably the greatest composer Italy or perhaps the World ever produced. He was of the humblest origins born in the small village of Roncole, growing up in nearby Busseto close to Parma. The town of Busseto is rich of Verdi memorials. The Teatro Verdi and the Museo Civico in the Villa Pallavicino, the Villa Verdi in a park near SantAgata are full of Verdis memorabilia, reminding us of the great Romantic Composer. Let us pay homage to the master by visiting locales of his origins and enjoying his compositions at places so significant in his musical career. 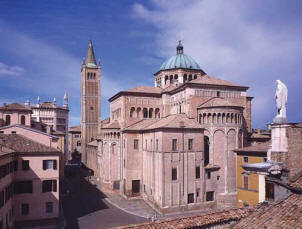 Full day privately guided tour with licensed guide knowledgeable about music and private car and driver in Parma area (including Roncole, visit Verdi House where Verdi was born, St Michaels Church, Villa Verdi in St. Agatha, where he spent his last years, Casa Barezzi Museum whre he composed his first opera, and the Teatro Verdi in Busseto.